Thomas Hart Benton (born Neosho, Missouri, 1889; died Kansas City, Missouri, January 19, 1975) was an artist. His works of the American midwest and south led to the development of artistic regionalism. Children can view his Indiana murals at an interesting website: Thomas Hart Benton. Leonhard Euler (born Basel, Switzerland, 1707; died St. Petersburg, Russia, September 18, 1783) was a mathematician. Children could learn about Euler’s Formula at: Euler Formula. Make sure you check out the morphing coffee cup/donut! Henry James (born New York, New York, 1843; died London, England, February 28, 1916) was a prolific and noted American writer. He wrote over 110 stories, twenty novels, and sixteen plays. Some of his most famous work includes The Turn of the Screw and What Maisie Knew. Older children can read many of his works at: Project Gutenberg. Jacqueline Briggs Martin (born Lewiston, Maine, 1945) writes books for children. She wrote Snowflake Bentley, and the book’s illustrator, Mary Azarian, received the 1999 Caldecott Medal. Children can learn more at: Jacqueline Briggs Martin. Bessie Smith (born Chattanooga, Tennessee, 1894; died Clarksdale, Mississippi, September 26, 1937) was nicknamed the “Empress of the Blues.” She combined spirituals with jazz, and some experts consider her one of the greatest singers in blues history. She died in a car crash in 1937. 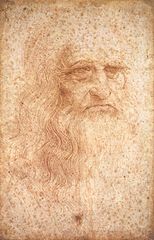 Leonardo da Vinci (born Vinci, Italy, 1452; died Cloux, France, May 2,1519) was a great artist and scientist. Famous works include Mona Lisa, Saint John the Baptist, and The Last Supper. His scientific interests ranged from plant studies to aviation. Idea: The Last Supper is a fresco; it is painted into the plaster on the wall. Fill disposable pie plates with wet plaster of Paris. Children can paint right into the wet plaster surface. Let the plaster dry, and then display the results. Children could also read Leonardo da Vinci for Kids: His Life and Ideas, 21 Activities by Janis Herbert.